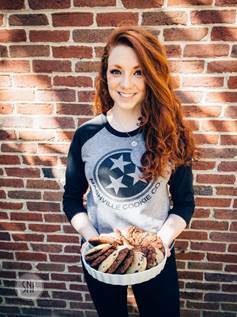 If you’ve had delicious cookies lately at an event in the Nashville area, you may have been tasting a small piece of recent Belmont alumna Grace McCaw’s start-up, Nashville Cookie Company. McCaw graduated with her entrepreneurship degree this May and has been hard at work baking and selling her cookies at local stores, festivals and special events. McCaw started her business between her junior and senior years at Belmont by making cookies to sell at various Nashville farmers’ markets. According to the company’s website, McCaw has been a native of the kitchen ever since she was young as she helped her mom “crack the eggs” for her favorite recipes. McCaw rekindled her love for baking when she moved into her first apartment with a kitchen as a Belmont sophomore. She began making her famous cookie recipe for her friends, who soon began asking for them again at their birthday parties and other special events. As the popularity of her recipe grew, so did her catering and retail opportunities. Today, the Nashville Cookie Company sells flavors of cookies ranging from chocolate chip to peanut butter banana oatmeal and other creative combinations. It also offers a flavor and design customization option for catering bridal events which allows the cookies to match the specific style of the couple they’re made to celebrate. For more information or to place an order with Nashville Cookie Co., visit its website.